View towards Ármannsfell (North) at Thingvellir. Lake Thingvallavatn on the right and the southern part of the Almannagjá massively dilatant fault on the left. Note the tilted blocks dipping towards the lake. Credit: Michael Kettermann. In this Minds over Methods we don’t have one, but two scientists talking about their research! Michael Kettermann and Christopher Weismüller, both from Aachen University, explain us about the multidisciplinary approach they use to understand more about massively dilatant faults. How do they form and what do they look like at depth? Michael (left) and Christopher (right) in the field. Credit: Michael Kettermann and Marianne Sophie Hollinetz. Iceland is a volcanic island in a unique setting on the Mid-Atlantic Ridge, separating the Eurasian and North American plates. A deep mantle plume lies beneath Iceland, and the combination of rift and plume leads to very active basaltic volcanism. Ubiquitous features along the rift zone are normal faults, often exquisitely exposed at the surface. Normal faults in basalts are also common in many volcanic provinces, like Hawaii, the East African Rift, and along mid ocean ridges. These faults often form as massively dilatant faults (MDF), which show apertures up to tens of meters at the surface and supposedly have large volumes of open voids in the subsurface. Figure 1. View along-strike a massively dilatant fault in layered basalt. The geometry of the vertical fault faces is prescribed by the cooling joints. Several basalt columns have been loosened and dropped into the fault, now being stuck in the fault (top) or filling the cavity (bottom). Opening width < 3 m. Credit: Michael Kettermann. These openings form pathways for fluids like magma or hydrothermal waters and consequently are of importance for volcanic plumbing systems, mineralization and geothermal energy supply. Iceland provides a perfect natural laboratory to study MDF. Due to its position on the Mid-Atlantic Ridge, Iceland is cut by extensional fault systems roughly from southwest to north. A wide range of oblique extensional to pure extensional faults can be observed mostly in flood basalts, but also in sub-glacially formed hyaloclastites (weaker volcanic sediments), pillow lavas and occasionally sediment layers formed in warmer times. Outcropping rocks in Iceland are younger than 20 Ma distal from the rift (eastern and western Iceland), while tectonic and corresponding volcanic activity at the ridge (central Iceland) constantly causes the formation of new rocks. The rough climate hinders soil formation and vegetation to overgrow faults, providing unique outcrop conditions. While it is relatively easy to access and study the faults at surface level, investigations into the subsurface are much more challenging. Direct observations are only possible down to depths of some tens of meters by climbing into the fractures. Cavities are often filled with rubble, sediments, water or snow (Fig. 1). Steep, open fractures with meter-scale aperture are hard to detect with geophysical methods (seismic reflection/refraction, ground penetrating radar, electrical resistivity tomography) at depths greater than some meters. We therefore started the massively dilatant fault project, a multidisciplinary, integrated project bringing together remote sensing, fieldwork, analogue modelling and numerical simulations. In essence, we utilize a modelling approach to recreate the structure and evolution of MDF at depth, using real 3D surface data as input and comparison data set. In a first step, we capture and analyse the surface expressions of MDF at a number of representative fault areas in Iceland. To this end, we flew 27 drone surveys during our five weeks long field season in summer 2017, covering a total length of more than 42 km of faults. 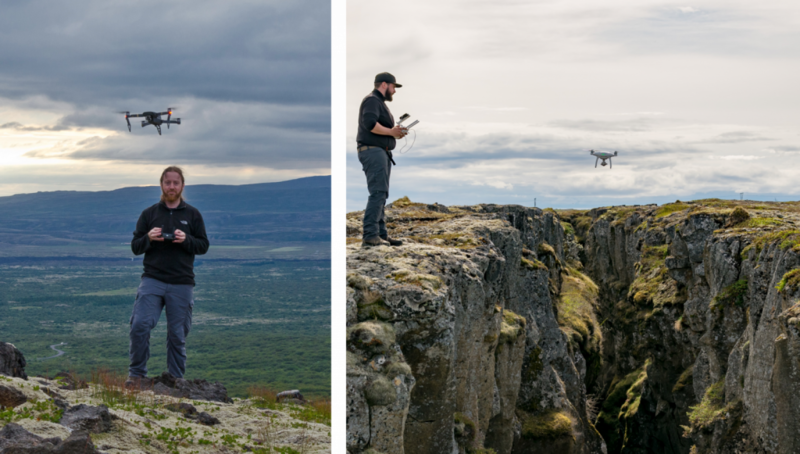 Luckily, in the Icelandic summer the days are very long, so the National Park Service allowed us to fly the drones early in the morning and late in the evening outside of tourist hours. For each area, we took several hundred to thousands of overlapping photographs (e.g. Fig. 2). We processed these sets with photogrammetry software, applying the Structure from Motion (SfM) technique. SfM is an increasingly popular, fast and cheap technique to reconstruct high-resolution 3D information from 2D images. This allows us to recreate digital elevation models and ortho-rectified photo-mosaics of the faults in resolutions better than 15 cm per pixel (Fig. 3). 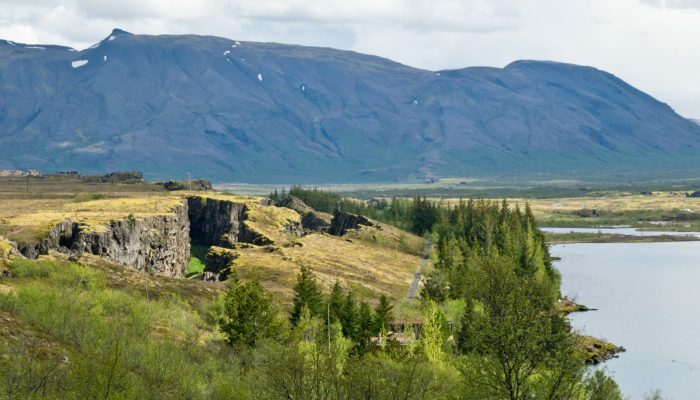 The largest area at the famous Thingvellir fissure swarm covers a length of almost 7 km with an average resolution of 11 cm per pixel. We use these digital elevation models and ortho-photos to retrieve a wide range of structural data. Mapping the fault traces in a GIS software allows for the measurement of fault opening width, throw, orientation and length. From throw and aperture, we can then estimate the fault dip at depth. 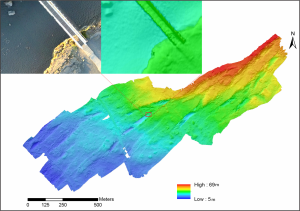 Digital elevation models further provide surface dip data that we then compare with observations from analogue models. Figure 2. A drone photograph facing South of the Almannagjá fault in Thingvellir, where the Thingvallavegur road crosses the fault. 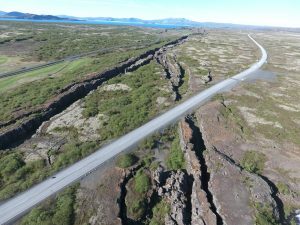 The Almannagjá fault resembles the western shoulder of the Thingvellir graben system with locally > 50 m opening width and 40 m vertical offset. Credit: Christopher Weismüller. . Figure 3. Digital elevation model created from drone photographs using photogrammetry software. It contains the faults at Sandvik on the Reykjanes Peninsula (SW Iceland). The detail panes (red square) show the DEM (right) at a higher zoom level and the corresponding ortho-rectified photograph (left). The bridge crossing the fault depicted in the detail panes is a famous touristic spot, known as „The bridge between the continents“, since the fault symbolically divides the North American and Eurasion plates. Credit: Michael Kettermann. Figure 4. Sideview of an analogue model showing three timesteps of the development of a massivley dilatant fault and associated fractures in hemihydrate (Bücken, 2017). Note the tilted block developing at the surface of the model and the dilatant jogs and voids in the subsurface. The opening at the surface is not directly linked to the fault at depth, but caused by the rotation of the tilted block. Credit: Daniel Bücken..
For the analogue modelling approach on the hundreds to thousand meter scale, we use cohesive powders as modelling material (Bücken, 2017). Especially hemihydrate powder has been proven suited to model dilatant fractures (Holland et al., 2006; Kettermann et al., 2016; van Gent et al., 2010) as it has a well characterized true cohesion and tensile strength. Faults in Iceland transform from opening mode fractures to shear mode faults at depth when overburden stress is high enough. As we are interested in the upper dilatant parts of the faults, i.e. above the shear mode faulting, we chose a basement-fault controlled approach, where a rigid basement represents the shear mode fault. It moves down-dip along a predefined surface, deforming the powder sieved on top. The basement fault dip follows the data we derived from the field and is set to 60° – 65°. The scale of the models calculates from strength and weight of the natural prototype and the modelling material. 1 cm of powder equals about 50 m of basalt. Results show a close similarity between field and experiment at the surface structures. Open fractures form with large apertures at the surface and often we observe the formation of tilted blocks (Fig. 4). The existence and scaled dimensional similarity of fractures and tilted blocks in the field and using a scaled material suggest a validity of other observations in the models. Glass sidewalls in the analogue models provide the opportunity to examine how the faults evolve at depth. We observe that large caves form underneath these blocks and we predict that these must exist in the field as well, albeit potentially filled with rubble. Our models corroborate earlier predictions that extensional faults are open down to 800 – 1000 m (Gudmundsson and Bäckström, 1991). We also learned that below that, a hybrid failure zone exists where dilational jogs, open extensional fractures between shear mode faults, provide lateral pathways for magma or water, even at depths where the overburden stress prevents the formation of purely extensional faults. The previously shown experiments investigated MDF at a larger scale in purely dip-slip kinematics. However, faults at rifts often have strike-slip components, forming normal faults with oblique kinematics. In further experiments, we therefore explored the effect of varying basement fault obliquities, i.e. the range between dip-slip normal faults and strike-slip faults (Bitsch, 2017). As expected, early phases of faulting are dominated by Riedel shears. Surprisingly, the surface structure of mature faults, however, does not change distinctly up to obliquities of 60°, but the subsurface connectivity decreases with increasing obliquity. Figure 5. Analogue model resembling successive layers of lava flows with cooling joints created by carefully stacking several layers of dried corn starch slurry (Winhausen, 2018). The dip of the basement fault is prescribed by the apparatus. The fault geometry generated in the model is very similar to the ones observed in Iceland. Large cavities develop and are partially refilled by loosened columns, as shown in figure 1. 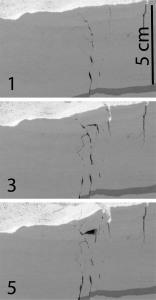 Tensile fractures develop on the surface of the footwall, similar to the hemihydrate model and the field. Credit: Lisa Winhausen. Zooming in on the faults, an inherent mechanical anisotropy (orthotropy) of basalts gains more influence on the macroscale structure of faults. Due to the shrinking during cooling of flood basalts, polygonal to blocky columns form and present regular weak zones in the rockmass. 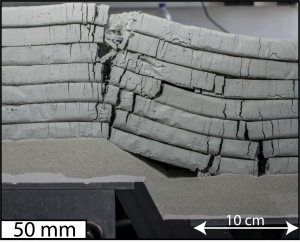 Introducing mechanical anisotropy into a stronger modelling material (dried corn-starch slurry) beautifully illustrates how the small-scale structure of the faults is affected by the layering of flood basalts and cooling fractures therein (Fig. 5; Winhausen, 2018). Close to the surface the strong basalt does not fracture, but propagating faults rather localize at the pre-existing cooling joints. This causes a jagged structure of the fault, formation of caves, and eroded basalt columns filling the opening fractures. We are currently working on implementing all these learning points into discrete element simulations, where we can adjust material properties in a way that allows for modelling deeper parts of the faults with better mechanical control. Bitsch, N.D., 2017. Massively dilatant faults in oblique rift settings – an analogue modeling study (MSc Thesis). RWTH Aachen University, Germany, Aachen. Bücken, D.H., 2017. Effect of mechanical stratigraphy on normal fault evolution – Insights from analogue models and natural examples in Iceland (MSc Thesis). RWTH Aachen University. Winhausen, L., 2018. Influence of columnar joints on normal fault geometry and evolution An analog modeling study Master Thesis (MSc thesis). RWTH Aachen University.